The Family Care Chiropractic team is dedicated to your health. It is important to everyone on our team that your experience be a friendly, and effective component of your overall health and well-being. If you have any suggestions for how we can serve you better, please don't hesitate to let any of us know. 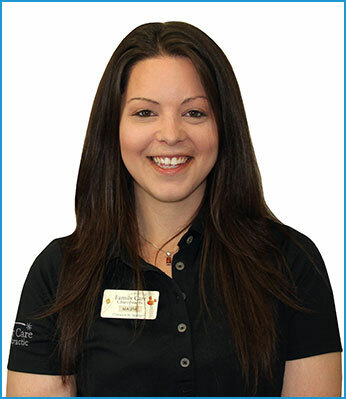 Laura was born and raised in Brantford and has a 10+ year background in the medical field. She joined Family Care Chiropractic in June 2017. She graduated with her Pharmacy Assistant diploma in 2006 and worked in retail pharmacy. She was driven for a career change to “natural health” and recently graduated, with honours from Medical Office Administration. She manages with efficiency the office flow, while answering the phone and scheduling appointments, creating a calm and healing environment. Laura loves to hear and witness patient’s health improvements and “miracles” through chiropractic, and would love to share her own personal chiropractic story with those that ask. Outside of the office, Laura loves to go to Grand Bend every summer. She enjoys taking care of her cats, playing baseball, biking, having bonfires and spending time with family and friends over dinner. Maura joined the Family Care Chiropractic team in March 2016. 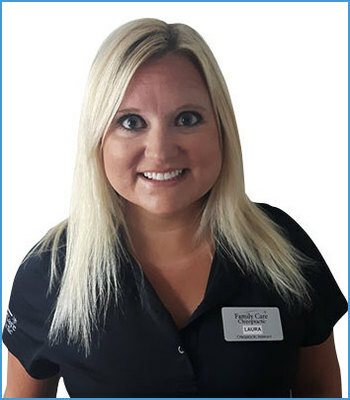 She graduated with her Medical Office Diploma in 2006 and has extensive experience working at other health care clinics. Maura grew up in beautiful Nova Scotia. Her east coast charm and warmth comes through clearly, the moment she speaks. She moved here following her high school graduation and has been enjoying living in Brantford since. Maura assists Dr. Sandy with the initial examinations and re-evaluations and enjoys getting to know our patients and watching their health improve. In her spare time, Maura enjoys playing guitar, going for nature walks, photography and spending time with her family and friends.